Happy Bloggers Challenge Friday! Thanks to those who played along with the Anniversary/Wedding Challenge, the challenge this week Halloween. I haven't created anything in over a week, thanks in part to a virus that has had me down, today is actually the first day I've even felt like doing anything. For the challenge this week, I created a 3D pumpkin using SVG Cuts Jack 0' Lantern template from the Fright Night SVG Kit. I resized the pattern 80%, then cut the pieces from Black card stock, Graphic 45 pattern paper and Vellum using the Silhouette. I just LOVE the way this turned out! The directions called for the eye and mouth pieces to be cut from Orange tissue paper, while I have a lot of crafty things, Orange Tissue paper is just not one of them. So I cut those pieces from Vellum and used the eBrush to color them Orange - problem solved! To add a little spookiness to my pumpkin, I randomly added some stenciling to the pumpkin using STAEDTLER Mars Graphic Markers, along with the Shatter Stencil and eBrush. 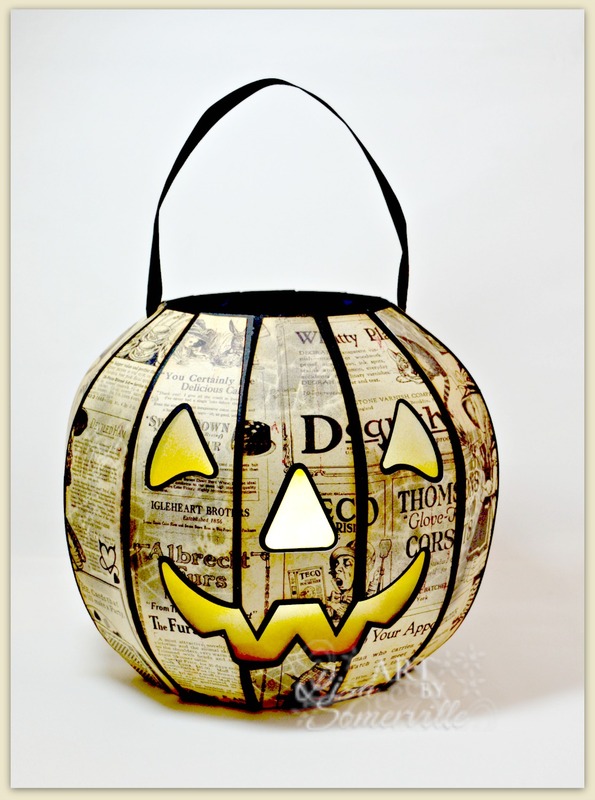 To create the handle, I added Scor-Tape to Vintage Black Seam Binding and sandwiched a piece of thin wire between the seam binding and added it to the Jack O' Lantern. If you'd like to play along with this weeks Bloggers Challenge, please link back to this post on your blog and mention you created your card for the Bloggers Challenge Halloween Challenge. Please add your link using the Link Tool below, your link should be a direct link to your Bloggers Challenge Post, use your name as the Title. Please do not link to cards that were created prior to the challenge date. Entries not linking properly, or backlinked will be removed. If you have the captcha enabled on your blog, please consider turning it off, as it makes it so much easier to leave comments. Oh I really love this. Great papers, cool design. That jack o lantern is gorgeous!! Wow!! Love it!! Thanks for another fun challenge!